Chemotherapy is a treatment method using a combination of drugs that will either destroy tumor cells or slow the growth of the tumor cells. Despite having the tumor removed with surgery, there may still be microscopic tumor cells present at the site of the tumor or circulating in your blood and lymphatic system that need to be destroyed to prevent distant and local recurrence. The most common chemotherapy drugs used for breast cancer include: Anthracyclines, such as doxorubicin (Adriamycin®) and epirubicin (Ellence®) Taxanes, such as paclitaxel (Taxol®) and docetaxel (Taxotere®). These drugs are often administered in cycles of time usually over 6 months and through intravenous access. In order to prevent damage to your smaller veins in your arm, a device known as a port may need to be placed under your skin in your chest to have access to your large veins in your chest for delivery of the medication. Do I need chemotherapy for breast cancer? Not every patient diagnosed with breast cancer will need to receive chemotherapy as part of treatment. Your medical oncologist will be evaluating many factors such as how aggressive the cancer is (how rapidly it is growing and dividing), your age, type of breast cancer, the size of the tumor, if it has spread to lymph nodes or other body parts, or the type of receptors your tumor is sensitive to in order to determine your need for the treatment. If your need is uncertain, some physicians will also order a specialized test known as the Oncotype Dx® (Oncotype Dx Breast Recurrrence Score, Oncotype Dx Breast DCIS score). These tests analyze genes of tumor cells and help predict response to the treatment, risk for metastatic disease and risk of local recurrence. When will I receive chemotherapy? Some patients will undergo neoadjuvant chemotherapy which means before the surgical removal of the tumor. This is often reserved for patients with more advanced cancer, cancer that has already spread to parts of the body other than the breast, and for some patients who may want to shrink their tumor in order to be candidates for breast conserving surgery. Other patients may receive adjuvant chemotherapy, which means after surgery and often before radiation therapy. 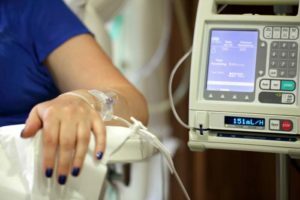 What side effects can I expect from chemotherapy? How does chemotherapy affect breast reconstruction? Patients who have received or are receiving chemotherapy may have an increased risk for infections which may affect breast reconstruction, especially with implants. For example, patients who are in the process of undergoing expansion of their tissue expander and are receiving adjuvant chemotherapy will need to have their blood work monitored to make sure the cells that fight infection are high enough to pick up bacteria from the skin that can sometimes enter the area of the expander during expansion. Also, patients will need to delay any surgery related to reconstruction until after completion of the treatment. Will I need chemotherapy and when will I receive it? What side effects can I expect and are there any medications to treat them? What is my risk for recurrence with and without the treatment? How will chemotherapy affect my reconstruction? « What is a Sentinel Node?